My child got sunscreen in his eye. What should I do? Stay calm. 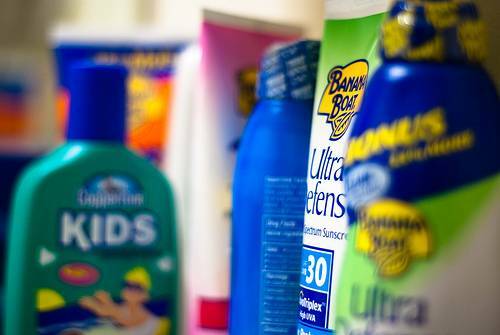 Your child may be in pain but this pain will not last and sunscreen in the eyes will not cause any lasting damage. If you are visibly scared, your child will be more scared. If you are calm, that will help your child be as calm as possible (which will help with the next steps). Wash with water. With my kids, I’ll lay them on the counter with their head hanging over the sink (looking up) and using a cup will gently pour water on the eye. I try to get them to look up and try to pry the lids open if I can. Artificial Tears. At our office or any drugstore, you can find lubricating eye drops that do not contain any medications. Use those for the next day or two to help with comfort. These are just for comfort so if they will only go in your child’s eye with a fight, consider whether it is worth it. If your child is still in some discomfort, try putting a cold washcloth over the eyes. If you’re concerned for any reason, visit your optometrist or feel free to visit me. If you just want to ask a question, email me at drbobchampion@gmail.com. When visiting kindergartens, I always remind kids that sunscreen is not for the eyes but that they still need to protect their eyes from the sun. The best way to do that is sunglasses with 100%UV protection. This will reduce their risk for many eye diseases including cataracts.